I was born and raised in Minnesota. I had a very happy childhood and have lived my life wearing "rose-colored glasses." I have painted in my head and heart my entire life. My career started in 1999 when two of my paintings were accepted for exhibition and sale in Sotheby's of London. One of the paintings was purchased by a New York Gallery and used for a national ad campaign. Since that time, I have won several best of show awards, exhibited in several international group exhibitions in the UK, had a painting selected for Artist Magazine Top 100 paintings, National Oil and Acrylic Painters Soceity Best of America 2004, Rising Star Award and in 2006 had 4 bird paintings accepted in the 19th International Animals in Art Exhibition receiving the SVM Award. While painting, I set an alarm to remind me when it is time to stop and pay attention to the rest of life. Ideas of paintings are always floating around in my head...Any little bit of glass or ray of light or feathers on the sidewalk might spark an idea. Everything is beautiful when contemplated in paint. I paint in the old master style of layering paints and glazes. It is interesting to me to combine this tightly realistic technique with contemporary colors and whimsical compositions. 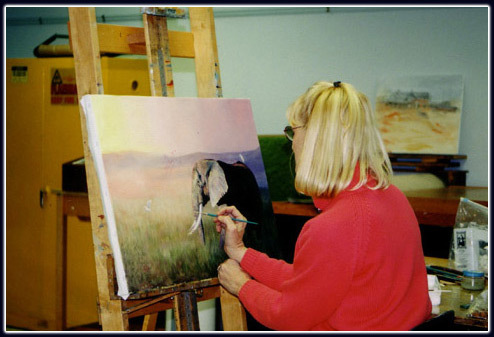 2006 - International Animals in Art Exhibition chose 1 of Valerie's paintings for the 2007 Publicity and Promotions campaign. 2007 - Rosetta Stone Gallery - Juno Beach FL. 2007 - Longstreth Goldberg Art - Naples FL. 2008 - Political Animals - National Juried Show - Naples FL.